However good you are at self care, sometimes things just stop having the same impact. Maybe you’re finding it more difficult to stick to your habits, perhaps you’re feeling tired or maybe you just feel uninspired. Sometimes we need ways of shaking things up to help us find our wellbeing groove again – to make it more fun and interesting! Self care shouldn’t just be the boring stuff (though that stuff is often important) it needs to bring you joy too. To be fair, this list can also be helpful if you ever feel like you’re in a bit of a rut. I personally know I thrive on routine, but if things become too much of a routine I just feel stagnant and need some change as well! Yep pretty obvious this one but sometimes it’s so obvious we miss it! It can be easy for a routine or habit to become a rut. If that feels like it could be you, just try some new things! Doing something new can bring a whole fresh energy into your life. Recently I changed up my morning routine by doing things in a slightly different order and it made such a big difference to how I felt! Have an unfollow party and remove any social media accounts that don’t spark joy – yep, let’s do a KonMari on your Instagram and Facebook! Then find some new accounts to follow. It can be super inspirational and refreshing to open your feed and see a whole raft of new images and people’s experiences. How often do you feel like you’re being creative? If the answer to that is not at all then starting to explore what makes you feel creative is a great way to revive your self care. Perhaps creating different makeup looks leaves you feeling creative, or experimenting in the kitchen with your own recipes. Maybe it’s taking photos with your phone on a nature walk – whatever it might be, give yourself some white space to fill with whatever makes you feel creative. If books are like food but for our minds changing up what we read can have a big impact! Try visiting your local library and picking out a book you wouldn’t normally try, asking friends for recommendations or even just switching from reading books to listening to them on Audible. Changing your environment can be physically changing where you are – maybe you need a mini break somewhere new, or perhaps you need to try working from a different location or visiting somewhere new on a weekend. This can also include changing the things in your current environment – one of the things I love is moving around my existing furniture and accessories. It’s free and it can just change things up enough to make things feel fresh. Who knew moving cushions or mirrors to a different room could make such a difference! Instead of dressing in the same way, try and rework your wardrobe into some never before worn outfits. If you always wear jeans and a stripy t-shirt, try wearing a dress instead, or pair the stripy top with a skirt or some pants you usually pair with a shirt. Creating some new outfits from what you already own can give you such a boost. In an ethical way of course – let’s not create more waste for the sake of it, but having a good old clear out of physical stuff can feel like you’re having a good clear out of your energy too. It’s sometimes just the thing you need to feel refreshed. Sometimes joining a community challenge or setting a challenge for ourselves can be a good way to stretch us outside our comfort zone a little. It can give us a new focus and level of motivation we wouldn’t otherwise be able to find. A challenge doesn’t necessarily have to be something super hard, but it should be something you need to dig a little deeper for and that will look different to different people. A challenge I’m doing at the moment is the 150 Hours Outside Project which is to spend 150 hours outside over the course of the year with Finley. It’s a little bit of a push for me to put that focus there, but doing it has given me the extra motivation to arrange to do something outdoors with him rather than staying inside playing! 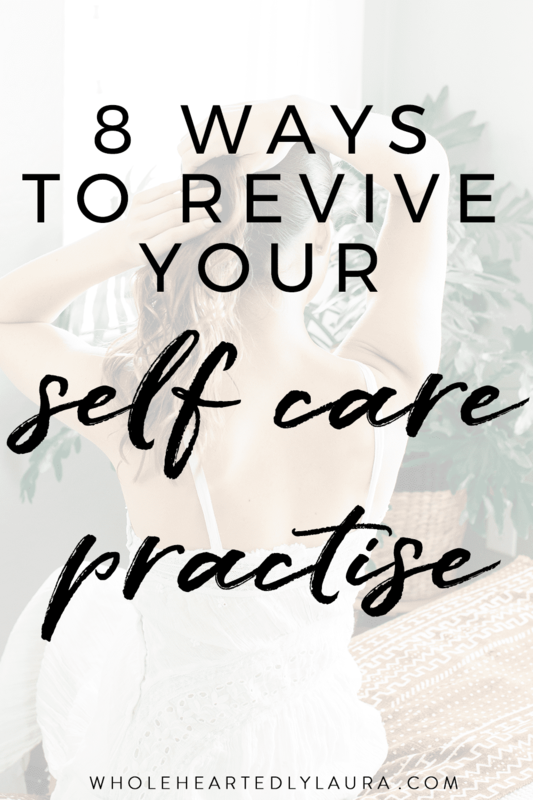 So there you have it, 8 different ways you can revive your self care practise! As always I’d love your thoughts, when you feel stuck in a self care rut, what helps you get out of it?